In the case you want to create identifyer based on the point location (coordinates) you can use GOIDGenerator or CRCCalculator transformer. If you are using GOID you should create your ID based on the first 16 characters of the generated GOID string. Later in this post I’m referencing to GOID in its shortened meaning (first 16 characters). If you are using CRC you should take into count only geometry not attributes (Attributes to use in CRC calculation shuld be empty). Solutions using GOID and CRC should generate the same result but in some cases it is not so. To make demonstration I have created sample workbench file. At the beginning of the translation process I have created geometry object (point) and created GOID and CRC attribute based only on position or geometry (attributes goid_1 and _crc_1) after that I have assigned coordinate system to geometry object and repeated generation of GOID and CRC. This time values are stored in different named attributes (goid_2 and _crc_2) . At the end of the process two testers checks equality of generated GOIDs and generated CRCs. 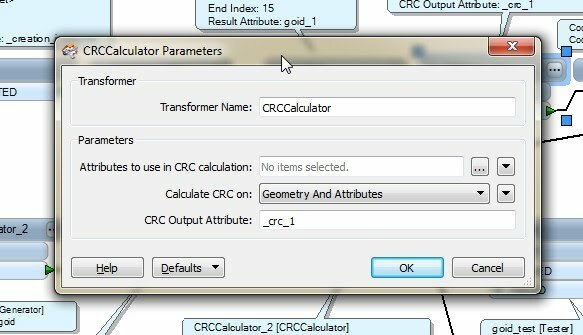 In the case of GOID the attribute value changed after CoordinateSystemSetter transformer what wasn’t case for CRC values. Take that into account when you compare data that are coming from two different sources, sometimes the coordinates can be exact the same but omission of coordinate system definition can mislead you if you are relying on GOID. 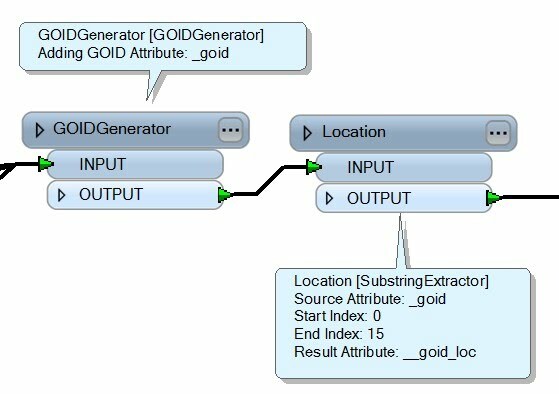 Let me describe to you case that drove me to explore more in detail GOIDGenerator transformer. Here is conceptual schema. Data in database do not require reprojection because they are in official coordinate system. New data are imported from csv file and after geometry creation (2DPointReplacer) data were transformed into official coordinate system. Feature merger should detect points that didn’t change coordinates. Detection wasn’t possible because branch with data coming from Oracle Spatial didn’t have coordinate system attached. 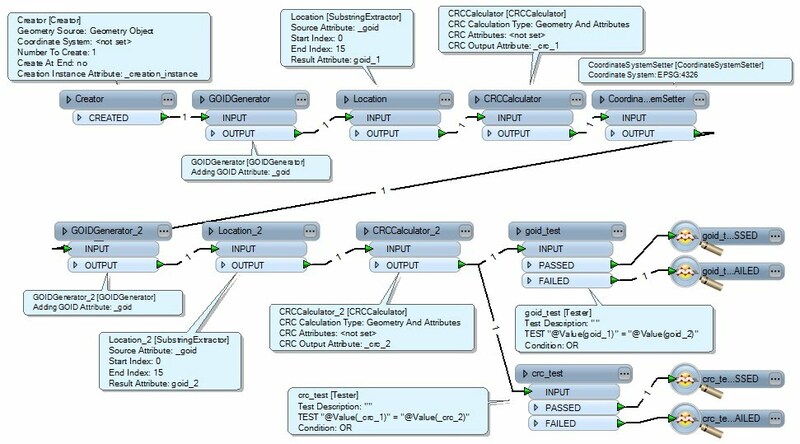 The solution to this case was simple: "attach CS to the Oracle Spatial Reader" … sometimes when you are debugging workbench process such solution is not so obvious and you have to make number of tests to find out what seems to be issue. There are always many solution but keep in mind that coordinate system information is in some way stored in GOID and not in CRC... sometimes you need that information and sometimes you don’t.